The Mitsubishi Electric Group will exhibit a variety of green products and technologies at Eco-Products 2014, one of the largest environmental exhibitions in Japan, which will take place at the Tokyo Big Sight exhibition complex on December 11-13. 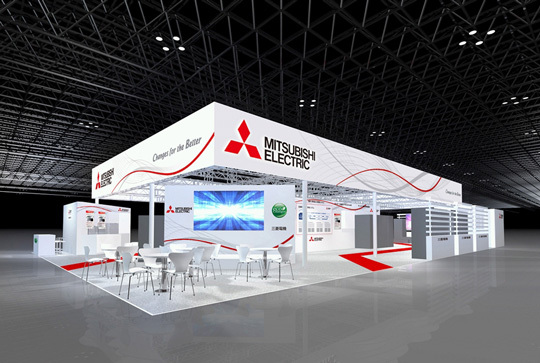 The Mitsubishi Electric booth, located at No. 5-013, East Hall 5, will present the Mitsubishi Electric Group’s initiatives to become a global, leading green company contributing to low-carbon, recycling-based societies. Exhibitions will center on products and technologies that help reduce environmental impact through energy saving, power generation and energy control. Additionally, Mitsubishi Electric will collaborate with other Mitsubishi companies AGC Glass Products Co., Ltd., Mitsubishi Chemical Holdings Corporation, Mitsubishi Motors Corporation and Mitsubishi Paper Mills Ltd. for the first time at the show. Under the theme Discover Ideas from Mitsubishi Companies to Change the Future!, the five companies will jointly organize exhibits at respective booths and visitor-participation events to introduce a wide range of green initiatives. The zone for Energy-saving Initiatives in Buildings and Factories will present solutions and know-how for reduced energy consumption during periods of peak usage, as required under the revised energy conservation law that became effective in Japan in April 2014. Case studies will introduce initiatives such as cutting-edge technologies incorporated in a new factory at Mitsubishi Electric’s Nagoya Works. The zone for Environmental Technologies in the Home and Society will include a demonstration of the beneficial effects of Mitsubishi Electric’s motors and controllers for automotive power steering in Mitsubishi Motor’s Outlander PHEV. The Mitsubishi HEMS exhibit will showcase a home energy management system that encompasses 14 various home appliances, showing visitors how comfortable and efficient homes will become in the near future. The main stage will present videos of case studies regarding initiatives to reduce CO2 emissions in manufacturing and other fields and a workshop for children to show how electricity can be generated using everyday items.